America GMO grown. Wake up people. GMO’s are counterproductive. Read about the new weeds that grow in monsanto’s mono-culture fields, they don’t die. The Evolution of Pollution, a book about a twenty-year lawsuit that follows the PCB issue. 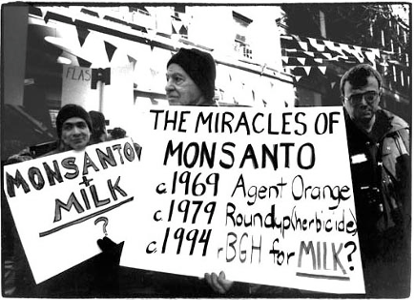 It needs to be established that the misinformation spun in the early years of GMOs was that they are safe. The FDAs own scientists came out against releasing GM foods until proven safe. The true consensus of the global scientific community is that GMOs are not safe. There are many books and articles on this subject. how can anyone write about Monsanto and NOT mention Bill Gates-yes, that Bill Gates-the spawn of a eugenics–as in mass murderer-who has bragged about how many lives were erased by his efforts–yes, he calls it “planned parenthood” while you and i call it genocide…and he calls his vaccines Population control–while you and i call it murder…and don’t look for the government to arrest him–they just leaned on him a few years ago for a piece of his Murder, Inc. action. My opinion, one of the most evil, sad, ignorant people (and i use that term very loosely)-that’s Monsatan’s largest stock holder-bill gates. Look up the family behind Monsanto. This could have only been decided with a full democratic legal process proving that Monsanto was guilty. It would be interesting to hear from those who feel that Monsanto has and is doing anything wrong. Has Monsanto,always did the right thing? Obviously not, but did they at the time? But to hold their isn’t against them is just as wrong as what they did. Would it be right to hate Germany today because of Hitler? What about our country because of the way we treated native Americans? No of course not. Some posters here have denied that they have done/ are doing anything wrong and that there are no ill effects from GMO and pesticide use. Also it is important to draw attention to the process of standing up for your rights in a democracy. We would not be enjoying this today if Hitler had won the war. I am not saying here that I do or don’t hold Monsanto to blame. Most companies today suffer financially in order to protect against environmental impact. It is up to the government to establish environmental standards. And many times the changes in governmental policy come as a direct result of consumer lobbying. After all if Neville Chamberlain had stood up to Hitler from the start, the war wouldn’t have gone on as long and less lives would have been lost. The United States is not a democracy. It is a republic. Gmos have been proven safe more than any other food on the planet. Pesticides should and are a concern for us all. However, they are necessary in order to produce enough food. Thanks to gmos, the need for soil applied insecticides and herbicides have been reduced. These are the ones that pollute ground water and can be the most dangerous to humans. If the citizens of a country or county or municipality disagree with an institution or policies, they have the democratic right to appose this. Most here believe that the use of GMOs and pesticides is dangerous to their health and many have done their research to back up their concerns. Governments on many fronts have now accepted the widely proven scientific proof that second hand smoke is unhealthy. Therefore they have banned smoking in many public areas. However, this took quite some time to bring into legislation. Many politicians, doctors, scientists smoked and believed it to be safe. This obviously was incorrect and big business fought to keep the idea of smoking as being safe. Regardless of whether you may or may not be correct in your views based on your current readings, more collaborative studies may prove to politicians and the public that GMOs and pesticides are all unsafe. Then you may look back on these practices as being a costly mistake. Smoking was first proven to be dangerous in the late fifties I believe. After that there were many follow up studies confirming this, which eventually led to where we are today. With gmos there is a universal scientific conclusion that gmos are safe. Pesticides on the other hand are a separate issue and not connected. Some pesticides due cause cancer. All should be used according to the label. They are also heavily regulated. Are they more dangerous than other things around us? No not really. Gasoline and diesel fuel are both highly dangerous, can cause cancer and pollute both the soil and water. You would be unable to support this assertion since it is of my belief that you have only read GMO positive information and not GMO negative information. 1) Politicians are only in office for a short time. They do not work on a long term policy framework. 2) Businesses are in the business to make money. The large companies will have built up years of influence and are able to influence politicians to their way of thinking. And they need to make profits fast before another company steps in. In this way many products are approved without long term study and research being done. Politicians don’t have final say in the acceptance of chemicals or gmos. That is left up to the regulator agencies that the politicians gave power to. I have read several studies on both sides of the issue thank you. Without talking results, I have one glaring problem. Why have the ones on safety been replicated thousands of times and the ones against haven’t been? Strange you have a famous one on rats and one on pigs, I kinda remember on coming out of Russia as well, but not for sure, it was a while back I read these. Nothing new, just rehashing these old ones. the one on rats especially has been shot down for a variety of reasons, so why not simply have a redo? Have oversight and do it right? Could it be because they already know the answers? Even countries that have a ban on growing them like Switzerland, stated that they found no harm with them, but no benefit for their farmers either. To fully understand the last part you must realize what ag in Switzerland is like. I don’t believe you are that naive that the top politicians have that little influence over what goes on in government. Nothing gets approved without the politicians final approval. I worked in government for over 25 years and I am well aware of how it all works. Again I know that you are not naive to realize that companies like Coke etc. have billions upon billions of dollars that they can easily put into research and it is all tax deductible. Once congress delegates authority to an agency, it would take another act to take it away. Do you really think this congress could get that or anything else accomplished. There is much that goes on in government that is not proper. Unfortunately the way you describe it here just doesn’t reflect the reality. Everyone in the Agency has his/her superiors. This goes on right to the top. There is solid communication and a pecking order. There are people with big salaries and they are not going to risk their jobs by not going along with what the top brass says. Do you really think that the Agency is one entity unto itself with nobody on top to give the final orders? Sure at the top you have the president, then a cabinet member, then a director and so forth. You believe that they would risk everything to approve something that was dangerous? Describe what exactly is dangerous here? OK i am being flippant but let’s say you were the president and the ultimate approval for a GMO has to be rubber stamped by you or a high ranking official influenced by you. We already know that you feel GMOs are harmless right. Why? Because everyone in the Agency is feeding you the pro GMO research. That’s all you are going to see. Why? Because those reports are influenced by Monsanto. Do you see how the system works? There isn’t, that’s why gmos have been approved. An example of an interesting “coincidence”? Jorge, other courts are expected to follow suit. health statistics from La Leonesa, the town where Carrasco (Professor Andres Carrasco was due to give his talk. I cannot speak for what happens there. I can only imagine that farming isn’t regulated there as it is here. Here we are required to follow the label and have guidelines about when and where we can apply chemicals. I already stated that chemicals are dangerous and need to be treated with respect and caution. GMOs and pesticides are two different things. There is no warning labels on GMO products. Because there is no need for them. Nor should there be. You even said they restricted spraying, not planting. GMO corn is registered as a pesticide, so not separate and very much connected. GM crops are designed to withstand herbacides. The company that sells the seeds, sells the poison. These are interrelated and very profitable to Monsanto that continues to design, produce, market and sell these creations fully aware of the disease and damage. But I suspect you know that. You are confused on many issues. Not all gmo corn is registered. Only the insect traits are registered. The chemical traits are not. The insect traits replace insecticides so you do not have to purchase more. All corn varieties can handle a large group of herbicides, certain gmos are designed to handle specific herbicides that other varieties cannot. As far as your disease and damage, it simply is not true. GMOs require pesticides. Organic is the meathod that reduces pesticide usage. Over 300 scientists have gone on record against genetic modification of our foods including scientists employed at the FDA. We do not hate Germany for Hitler, but Hitler did have to be stopped. We do not hate the USA because Monsanto has their world headquarters here. Still, Monsanto must be stopped to save us from things like RoundUp (glyphosate) and criminal activities beyond the scope of this article. What is stunning to me, is that a corporation can still be profitable after having to pay out so much in lawsuits and lobbing. By the way: the USA is no longer considered a democracy or a republic. I don’t know what we are at this point. A corpocracy? You need to do a little research I’m afraid. Organic pesticides in some cases are even more dangerous than their synthetic counterparts. Gmos in many cases reduce or eliminate the need for pesticides. Your 300 scientists are also in the minority as an overwhelming 85+% agree there is zero risk. How much does Monsanto pay you Roberts? Really! Monsanto’s deceptions and lies all the way through. The only time GMOs reduce pesticides is when they are altered to produce their own pesticide which is much worse as it cannot be avoided right before harvest or washed off the outer layer of the food. It is in it and you eat the pesticide just as the insect that it is designed to kill. Really?? You are either an agent for Monsanto or incredibly naïve to the facts. The whole reason Monsanto genetically altered corn, soy, etc. is to make it resistant to Round-up which will kill any green living matter except their GA crops to increase the sale of Round-up (herbicide) and poisoning even more of our air, soil and ground water not to mention our food supply which they spray Round-up directly on now. Poisoning everything is what they do and they do it better than anyone.